Students deserve support in obtaining their education, and UFCW Canada is proud to assist members and their families with the costs of higher education by providing thousands of dollars in scholarships through the UFCW Canada – BDM Scholarship program. To create more awareness of this renowned union scholarship, UFCW Canada recently held a referral contest that attracted hundreds of additional scholarship applications. 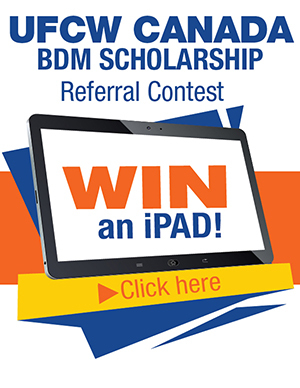 Every member who referred an eligible student to apply for a 2019 UFCW Canada – BDM Scholarship received a chance to win a brand new Apple iPad. The 2019 UFCW BDM Scholarship Contest is now under way. To enter for your chance to win one of two Apple iPads, please see below. Complete a ballot each time you refer a student* to apply for the 2019 UFCW Canada – BDM Scholarship Program. One iPad will be awarded through random selection, and the second iPad will be awarded to the member who refers the most applicants via online ballots. Fill out a ballot with your personal information and the contact information of the eligible student who may be interested in winning a UFCW Canada - BDM Scholarship. Once you click submit, an e-mail will automatically be sent to the student’s e-mail address, with a link to the online scholarship application. Do it again! Each new referral means another chance to win an iPad! * Eligible students must be a UFCW Canada member in good standing, or a child or spouse of a member, and must be attending full-time studies at a Canadian university, college, or other recognized post-secondary institution. * The referrer must be a UFCW Canada member in good standing. * The contest ends September 30, 2019. * In the event of a tie for the second iPad, the member who submitted all their ballots first will be selected.